When this typewriter came off the factory floor in 1966, Czechoslovakia was just two years away from the Prague Spring. Which at the time was the first real crack in the Soviet Union. Perhaps that important milestone was written on a Consul typewriter. Even the name suggests a diplomatic approach to writing. In the waning days of 1989 the peaceful transition to democracy was complete with the Velvet Revolution and the election of the writer president Vaclav Havel. Did Havel pen his works on a Consul typewriter? With its soft colors and rounded edges, the Consul speaks to a certain tranquility. But don’t confuse its quiet looks with a pushover, this is a solid machine. The body is well constructed and is quite heavy for its size, lending it an authoritative feel. The keys are precise and light, while the line space lever is easy to catch with your fingers. Like most ultra-portables, it has a carriage shift, but it rises and falls with ease. As for type alignment, it’s a bit over the place. You’re not going to produce a final draft manuscript with this typewriter. 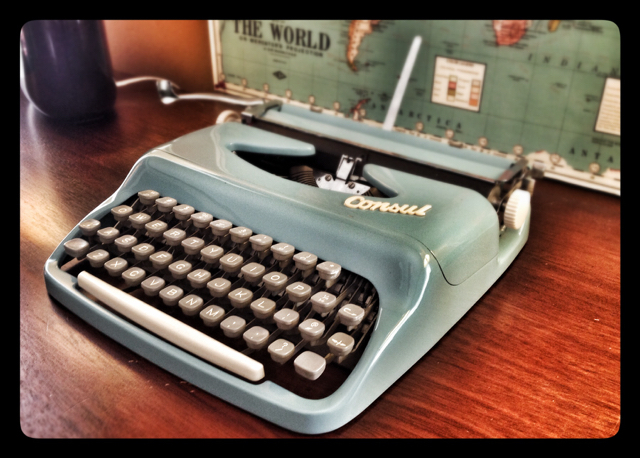 But that’s okay, this is a writer’s typewriter, the kind meant for the free composition of thoughts. I’d say toss it in the handy travel bag and hit the road, but the one this one came with has brittled with age and feels like cheap vinyl. Which is too bad, since other portables in this category, such as the Hermes Rocket, come with travel hardened shells or cases. But for feel, the Consul is right up there with the Olympia SF and the Hermes. Alignment has a lot to do with a specific machine. It’s unfair to suggest all Consuls have poor alignment unless you are speaking from having typed on several. In a way that is the difficulty in reviewing any typewriter – most of them are 30+ years old, and due to their condition, it’s no longer a control study situation. I was irked at the action on my Olivetti Studio 44 and then replaced it with a different one, same model – strikingly different and improved. Do you know any connection to this Consul 232 and Ferlette typewriters?